This recipe is from an article in Food Network Magazine called “Let’s Roll”. Along with the Gingerbread Cake Roll recipe, it features a few other recipes plus some photos and tips on assembly. 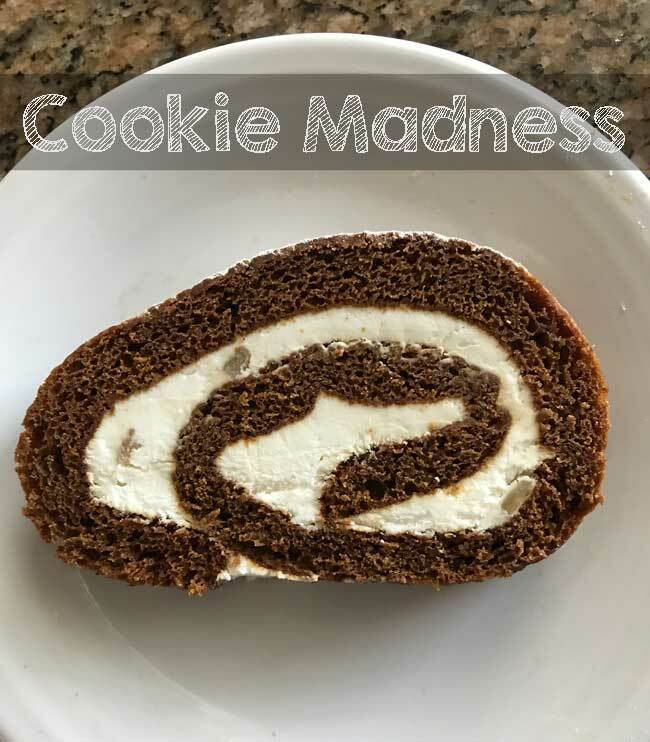 I plan on trying the other recipes, but for now I can say the Gingerbread Cake Roll is great! Plus you may even have all the ingredients on hand — flour, eggs, spices, mini chocolate chips, candied lemon, mascarpone cheese…er, uh. Okay, well maybe not. I went out and bought candied lemon peel and mascarpone cheese. It was worth seeking them out, but if you can’t find the lemon or mascarpone, you could skip the lemon and use soft cream cheese. Another great thing about the Gingerbread Cake Roll is how well it freezes. At 11 inches, this a long cake roll, so I cut it in half and served one half immediately and froze the other. The half that was frozen was just as good if not better. It’s definitely easier to slice and plate when frozen. A gingerbread cake roll filled with vanilla cream. Preheat the oven to 375 degrees F. Spray an 11-by-17-inch rimmed baking sheet or jelly roll pan with cooking spray; line the bottom with parchment paper. Separate the eggs. Put the yolks in mixing bowl and the whites in the bowl of a stand mixer with whisk. Whisk the flour, cinnamon, ginger, baking powder, baking soda, nutmeg, cloves and salt in a medium bowl; set aside. Beat the egg whites and granulated sugar with a mixer on medium-high speed until stiff peaks form, 5 minutes. Set aside. Whisk the egg yolks, melted butter and molasses together in the other bowl. Stir the flour mixture into the yolk mixture until smooth. Stir one-third of the whites into the batter with a rubber spatula, then fold in the remaining whites in two batches. Spread the batter in the prepared pan; bake until a toothpick inserted into the center comes out with just a few crumbs, 10 to 12 minutes. Meanwhile, make the filling: Beat the heavy cream and confectioners' sugar with a mixer on high speed until soft peaks form. Beat in the mascarpone and vanilla. (Do not overbeat.) Fold icandied citrus with a rubber spatula. Make the topping: Combine the 2 tablespoons confectioners' sugar and cinnamon. Gently unroll the cake. Spread the filling over the cake about 1/4 inch from the edges; reroll (without the towel). Trim the ends with a serrated knife. Transfer to a platter; dust with the spice mixture. Lemon filling would be good, but there’s so much spice in the cake you wouldn’t want too much lemon in the filling. The magazine also includes a lemon and vanilla flavored one. The fact that it freezes well also suggests it would make a great Charlotte Cake. A lemon filling to play off the candied lemon peel in the roll would a starting point. Sounds good! I like the freeze ahead option!